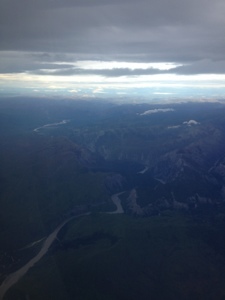 World Flight 2013: More Northern Canada...and this might be the last blog? 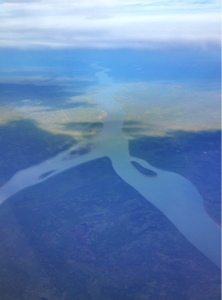 More Northern Canada...and this might be the last blog? This photo was taken thru the aircraft window yesterday afternoon (Tuesday, 3 Sep) during our flight to Yellowknife showing our own shadow surrounded by a circle containing all rainbow colours. How beautiful is that? We arrived very late. Needless to say, last and we hassled to find parking on the small apron we were pointed too. That made us even more late getting to the hotel, very thirsty, hungry and tired. And there was still work to do, especially for Dietmar: flightplanning, permissions, calculations, etc etc. It is a real disadvantage I can not help him with that kind of work. It usually takes him 3 hours, and if the net is slow so much longer. In Iqaluit I got up at 03:30 in the morning to do mails and blog in the hope the net would not be used by too many people and would work better. Our alarm clock goes off at 05h00, while I shower Dietmar looks at the weather for the areas we fly to and rechecks flight plans. What ever he has to do for preparation he does before we go down and search for a light breakfast. Most Hotel Restaurants only open by 07h00, too late for us. We try to be in the air by 08h00. We fly most days until late afternooon with a technical stop for fuel etc in-between. And arrive at the over-night place late, like yesterday. .... we must investigate the option of installing rocket boosters to our aircraft. Very low pressure weather systems, a Headwind of 60knotes is making flight conditions very unfavourable and slow and it is still very warm outside with a temperature of -3 Degree C @ an altitude of 16000 feet. We rarely have those temps in Southern Africa, very unusual. 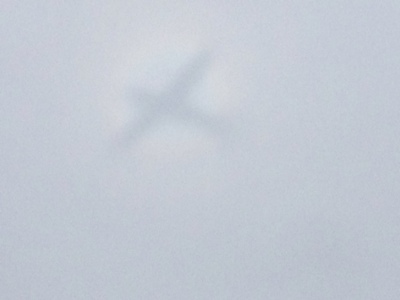 Performance of the plane is not satisfactory to the pilot. 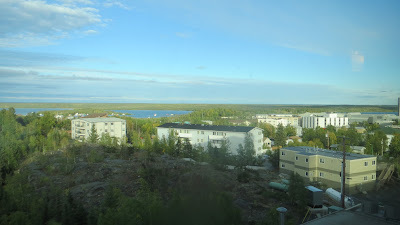 The area below us is full of lakes, forrests, rocky areas, no settlements, no roads, just wilderness. The sun is out, clouds in the distance. 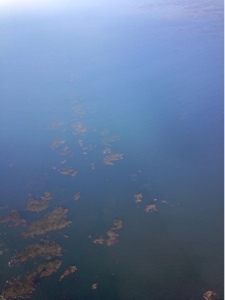 Wonderful flying!!! Still the same landscape below us, a local told us full of Elk, Bears, Bisons. And the lakes full of fish. Nature Pure. 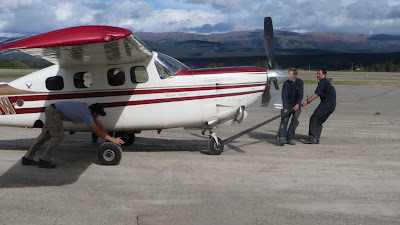 We will have a technical stop in 'Whitehorse', Yukon, 2300 feet elevation, and then another leg 450 nm to Anchorage / Alaska. In 20 min time we will have reached 'Whitehorse', local time 12h30, SA 21h30. Now we want to start up, but the starter motor does not turn fast enough, ****, we sit here, everyone else has left, we are looking for someone who could help us start up with external power. Okay, they have come and gone, their equipment was not powerful enough, maybe their own Battery is on the weak side. We wait again. Now the helicopter guys come across, with a different device. It also does not work. We wait again, someone else is going to meet us here. 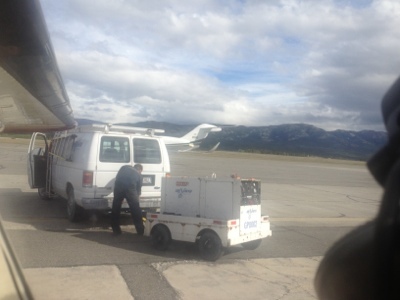 If we get the engine started, we leave for Anchorage as planned and find a Workshop to exchange the battery ... If it is the battery. Tomorrow is supposed to be a rest day, well it looks different for us. We are stuck in all senses, they pulled us to the workshop, got the aircraft stuck in the sand while pulling it towards it, and now what???? Now they got more manpower, and with pulling and pushing they freed it, nearly twisting the front wheel but not quite. 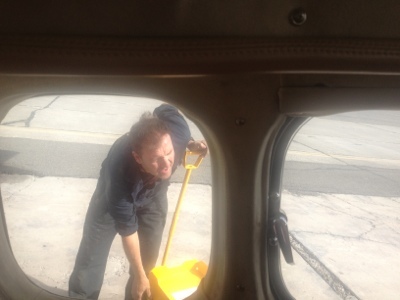 Now they decide to work outside, in the wind, next to the taxiway, we are totally speechless for a change. They all think it is the starter generator. Can you believe such luck??? They have one thats fits!!! They say. Let's wait and see. If the part fits, lets keep thumbs, it is that!! !, if they get us going, we will fly into Alaska still tonight, sunset is only 20h55, most of the way over the mountains will be in light, by touch down it will be just dark. That will be no problem. This is a very long Blog, it might be the last one. Lets hope not.